Hard to believe, but summer is almost half over. Before the back-to-school rush hits, before unused vacation time slips away, why not help employees and customers get out and live a little? For those who enjoy traveling, National Gift Card offers a wide selection of gift card options. Take the Hyatt Gift CardTM, for example. Use the card to send your patrons or employees to any Hyatt Place, Hyatt House, Hyatt Regency or Grand Hyatt in more than 400 locations across the country. There they can use their Hyatt gift card to pay for lodging, food and beverages or other amenities such as spa services. Don't forget, Hyatt gift cards are even redeemable outside the U.S., in places like the Caribbean and Canada. Hyatt isn't the only luxury travel brand NGC offers, either. Want to fly to an exotic locale? Use the American Airlines Gift Card towards the purchase of a ticket to hundreds of exciting destinations throughout the world. Of course what would a luxury trip, or summer for that matter, be without good food? 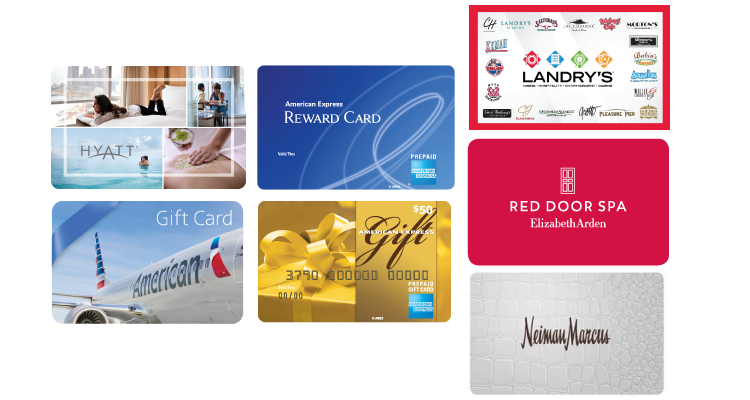 Landry's Gift Cards can get your people into a wide variety of luxury restaurants, such as the famous Morton's Steakhouse. There is nothing quite like a little summer shopping to perk up certain customers or employees. Neiman Marcus Gift Cards will give them access to the latest in luxury fashion, fine jewelry, hand bags and specialty items that store is famous for. Or, NGC offers a variety of American Express Reward and Gift Cards, perfect for that special employee incentive or thank you. A long shopping trip calls for some relaxation, doesn't it? At Elizabeth Arden Red Door Spa, your gift card can help you escape for a quick beauty fix, a signature spa treatment or a luxurious spa day. Whatever luxury treat you have in mind, we're here to help to make it happen.